Here are just a few pictures of the Continental Presidents Clubs at IAH, which I visited upon arrival in Houston on Friday. 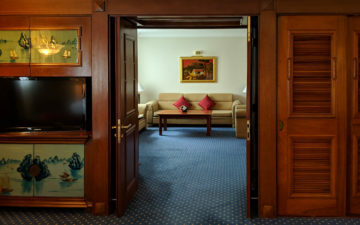 The first pictures are of the A concourse Presidents Club, which is small and nothing special. After that we headed over to the E concourse Presidents Club, which is impressive to say the least. I wish I would have taken more pictures, but I kind of forgot. This Presidents Club is a full three floors and has a grand feel to it. This is also the Presidents Club frequently used for international departures. Overall I’d say this club is probably the best US carrier lounge in the US. I realize the pictures don’t really do it justice, so I apologize. I agree wholeheartedly. The Concourse E P-Club is the nicest airline lounge I’ve ever been to in the US.